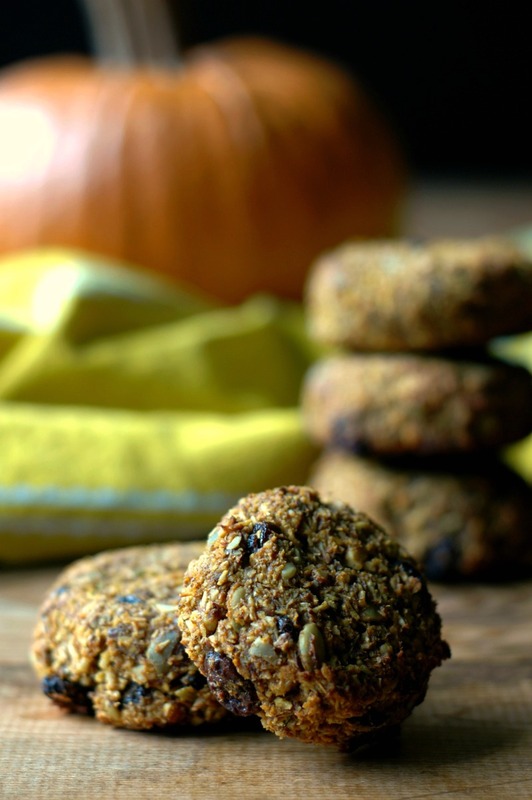 Get out the door fast with breakfast cookies made with sweet pumpkin and warm fall spices to make any school morning more cozy! …has made me really re-think my morning routines! This is my first year of having all 3 kids in school at least part time, and I will be honest in saying that I envisioned having a little more time to sip my coffee every morning! That is just hasn’t proven to be the case yet with 3 sets of field trips speckled through the month, projects to be done, after school activities, and of course lots of fun fall family outings to be had! One busy morning it finally hit me. We had already made it to the middle of September, and I hadn’t made one pumpkin thing in my kitchen. I also had gotten into a rut of the same sort of breakfast routine every day. Nourishing? Yes. But savoring this season that we only get to enjoy a couple months out of every year? No! So I set out to create a special something for breakfast that would help us enjoy the season, but not leave momma stressed for time on a school morning. Oh yes! It’s a thing, dear friends! A few years back, I instituted “breakfast cookie Fridays” not only as a fun way for my girls to end the school week, but also as a way for myself to be kicked back and enjoy my coffee a little longer on a Friday morning. I set up a “breakfast bar” with a tray of breakfast cookies, a bowl of hard boiled eggs, and hot tea or raw milk to drink. The girls help themselves and I am hand free. It is a beautiful thing! 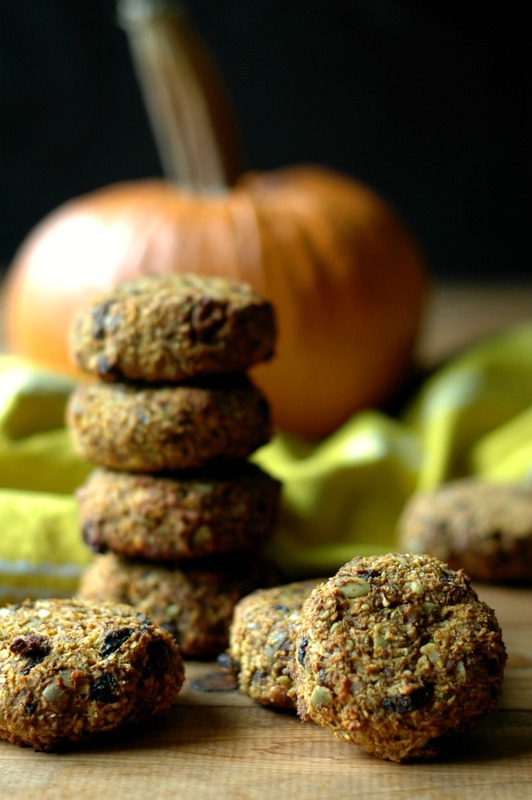 A new breakfast cookie Friday addition with a fall twist! So in my intentional decision to savor the fall despite our busy schedule, these pretty little pumpkin raisin breakfast cookies were born! Warm spices with sweet pumpkin and maple syrup make for a cozy morning with a cup of tea or coffee (or my favorite pumpkin spice latte?!). I’m telling you, your kitchen is going to smell *amazing* after baking these simple little cookies off! We have been enjoying them over the last few weeks while I perfected the ingredient ratios and tried some swaps, and the girls have finally given me the big 2 thumbs up for being post-worthy! Keep your eyes peeled in the ingredients for how to swap out the nuts. I have made a couple batches all seed based, and they taste so good! Even if you aren’t nut free, sometimes it’s nice to rotate around and get some nutrients from seeds you don’t have often. 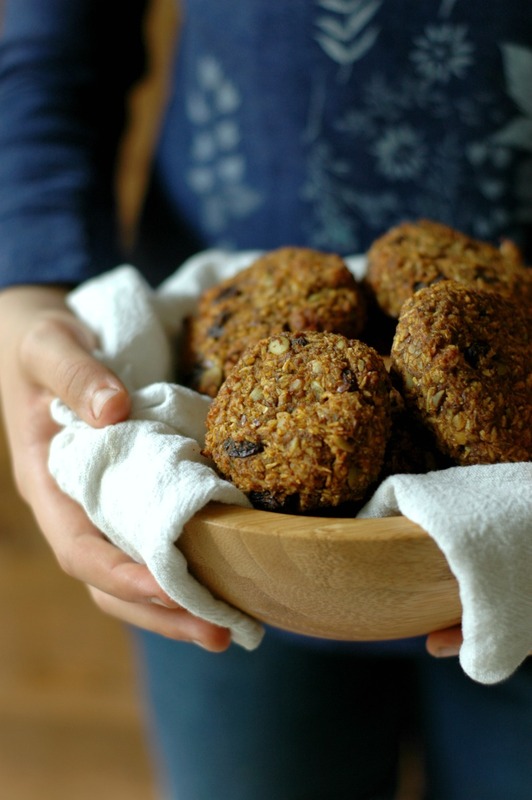 These breakfast cookies are naturally egg (and dairy) free too! 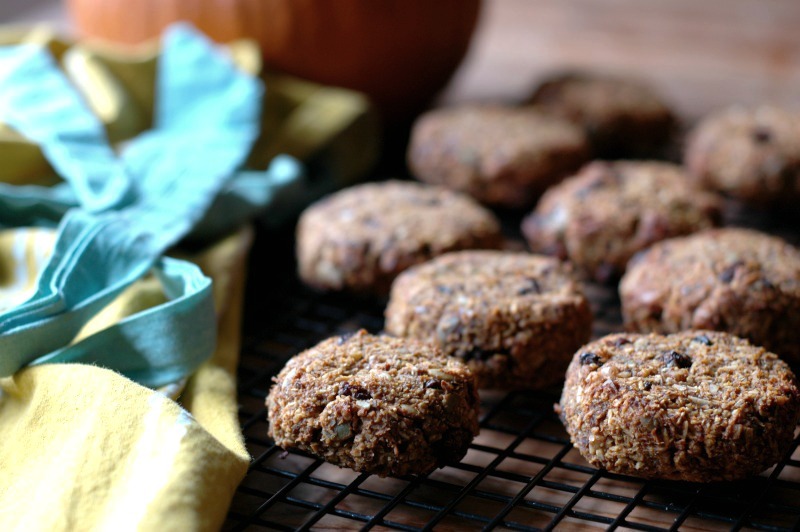 Pumpkin makes a great egg replacer, and the flax seed meal also provides a natural bind so that I could skip the egg. 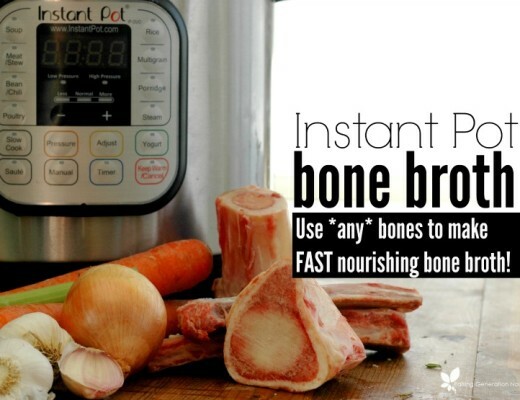 I have made 1 batch with a good few tablespoons of grassfed collagen for extra protein and gut nourishment. They turned out great, so that is an addition you can put in if you wish! Embrace the fall, my friends! I sincerely hope I’ve sparked a bit of thought into you to enjoy this season, dear momma. The kids will remember these warm smells coming from the kitchen as they get older, and I’m telling ya…as my oldest nears more pre-teen ages, I’m starting to be more aware of the need to be intentional at memories versus the survival mode that the newborn years were! Embrace this change of season! ¼ cup nut or seed butter of choice I've made these with almond butter, tahini, cashew butter, and almond butter. Sunflower seed butter should be fine too. 1/4 – 1/3 cup pure maple syrup Raw honey would work here too. I think the warmth of the maple syrup works well with the pumpkin and pumpkin spices! Put all the ingredients into a medium mixing bowl and combine well with a spatula. Form the dough into cookies using your hands, and place on a Silpat or parchment paper lined baking sheet. LOVE the idea of BREAKFAST COOKIE Friday’s?! 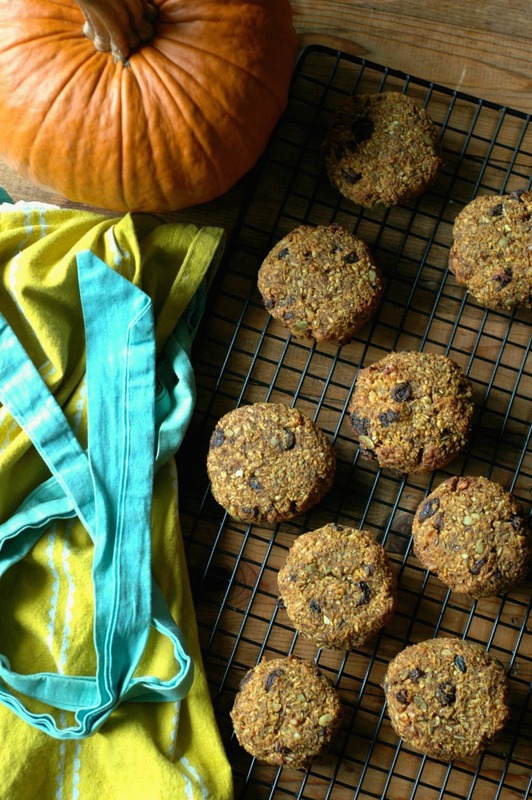 Here are more recipes to add to your own breakfast cookie morning rotation! 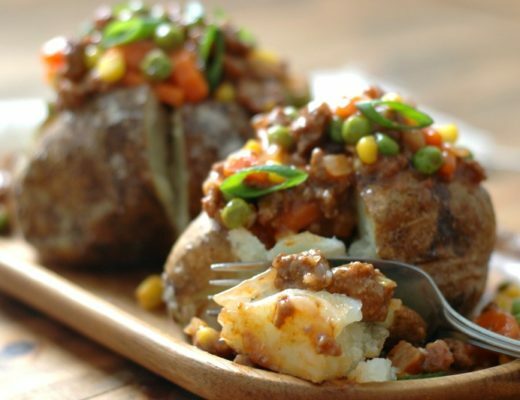 Shepherd’s Pie Loaded Baked Potatoes :: PLUS! How To Make Baked Potatoes With The Crispiest Skin & Creamiest Inside! These look and sound yummy! I plan to make them tomorrow. How many cookies do you usually get out of one batch? I like that they don’t have eggs or baking soda, great for the GAPS Diet and egg-free kiddos. 🙂 FUN! Plan to make them for my egg-free son! These look amazing, I love the texture on them! Breakfast cookie Fridays is such a great idea! These cookies look sooo yummy and chock full of all the good stuff. I love this so much I can’t even tell you! Such a great grab and go breakfast or snack! Happy day! I have EVERYTHING to make this recipe TODAY! Love it when that happens! Enjoy! Thank you for this recipe. I am always looking for new ideas. It looks like a must try! Your breakfast cookies always look amazing and these are no exception. 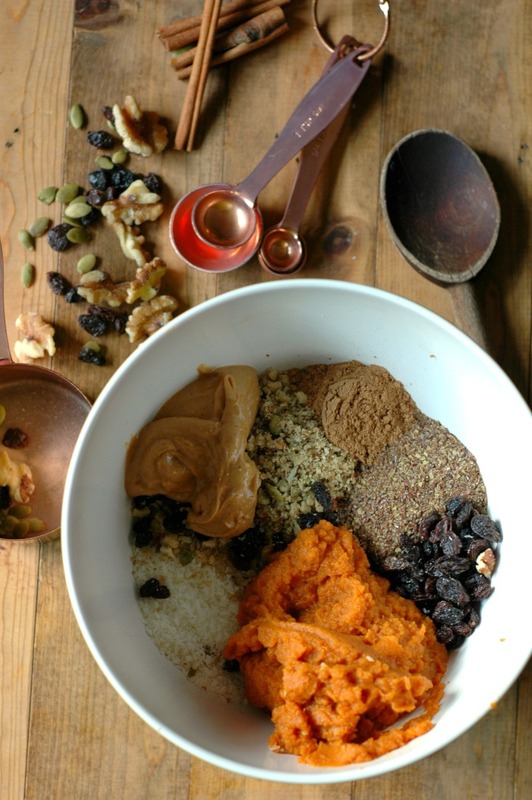 Love the fall flavors and all the healthy ingredients. Yum! You had me at pumpkin spice! Love this flavor combo! I love hoe much you were able to pack into these! I bet the texture is amazing and I love all of those fall flavors. 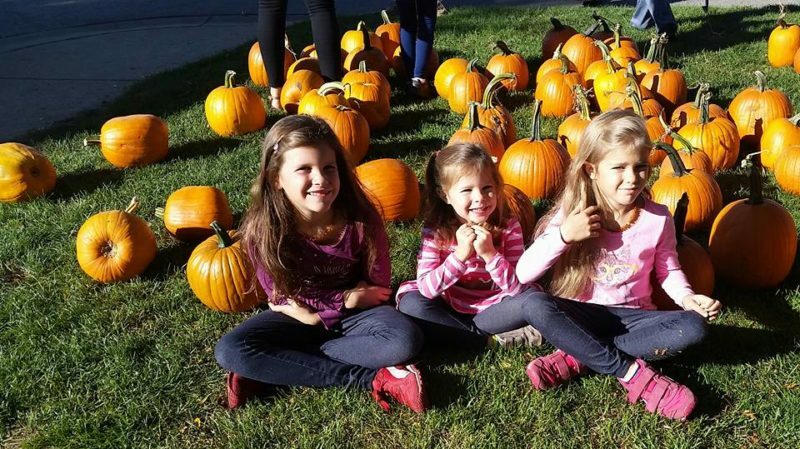 The girls are getting SO big! Such a sweet photo. 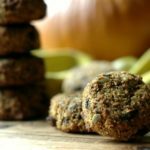 I used to make a breakfast cookie, but looking back I just laugh because it was so unhealthy – can’t wait to try yours out, they look both delicious and healthy! You always have the most creative recipes, perfect for adults and kids alike. Besides, we all get sick of eggs, right? Eating pumpkin and reducing stress is the golden combination, right? Looks like you’re having a blast despite being busy! Enjoy those young years and all the field trips. These girls must have the most enviable lunch box treats! Pumpkin is one of my favorite flavor ! Need to make these ASAP. YUM !! Cookies for breakfast? Heck yeah! These look amazing. These look fantastic – would never consider pumpkin for something like this -superb! 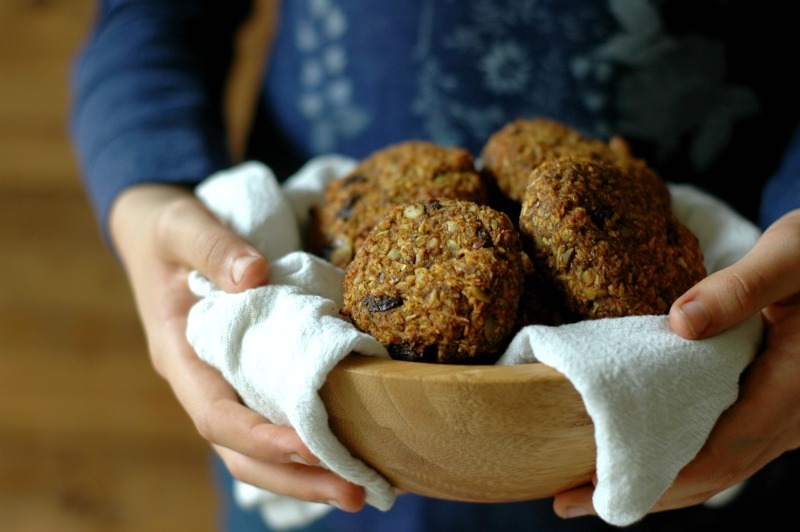 Love the idea of your Friday breakfast bar, and these cookies sound so tasty and wholesome! Since we are not egg-free, is it possible to sub an egg (or two) for the flax meal? Made these tonight and love them! I used the chia seed option (instead of flax meal), and replaced the raisins with chocolate chips. Because why not (-: They’re filling and I love how easy they were to make…one bowl recipes for the win! I’m so glad you enjoyed them Meg!